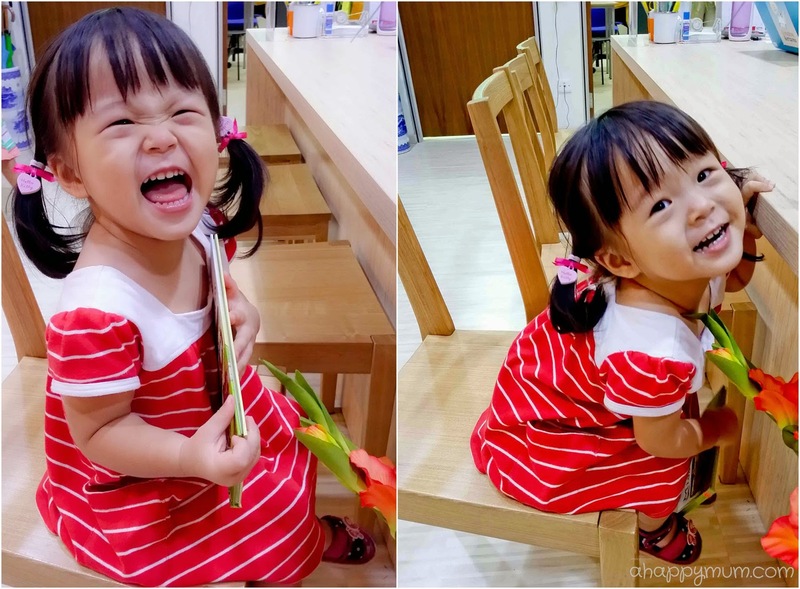 When we were living in Sweden, though there were dozens of Singaporean kids who were born and grew up there, there was something that made Angel quite outstanding by the age of three. No, not just the way she would gorge on two bowls of porridge for every meal or that she loved to karaoke and would sing along to pop songs. 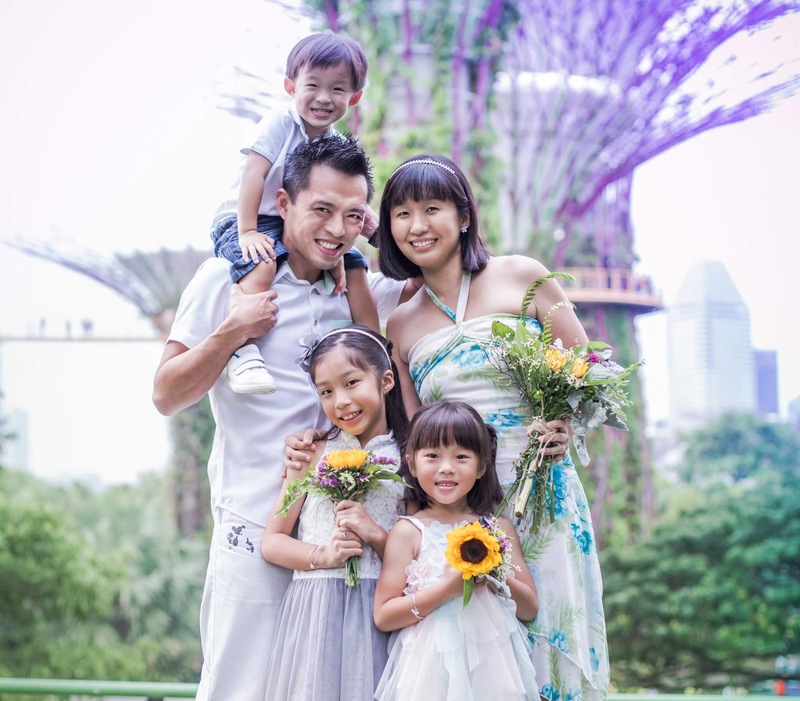 What made her different from the majority of the kids was that she could speak in fluent Mandarin. 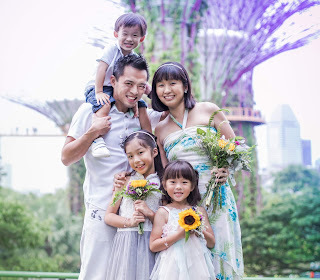 Since the hubby and I both come from Mandarin-speaking families, plus the fact that I used to teach at Berries, it came naturally for us to teach our child to communicate in Mandarin over English because we want her to first develop a love for the language and be proud to use it as her mother tongue. Sure, she can write the letters of the alphabets, sing nursery rhymes and understand simple English words, but if you were to ask her to say a complete sentence in English at that time, she would be tongue-tied. In fact, when we came back to Singapore and she started going for half day school where lessons were conducted in English, her Indian teacher would come up to me saying that she had trouble understanding Angel as my girl had a tendency to reply in Mandarin even if she did understand the question being posed to her. When it came to speaking English, it was usually bits and pieces and the listener would have to string them together to make any sense. The thing is, given the fact that almost all her peers use English as their first language, it didn't take long for her to pick it up and soon enough, I saw that she was making vast improvement on her own. Nonetheless, I was still hesitant if she was liking English as much as she loved Mandarin. In my view, you first need to love a language so that you have a passion, a desire and a driving force to read more, speak more, hear more, write more and learn more about it. So, when Creative Horizons offered to sponsor Angel a term of English lessons under their professionally trained and well-qualified teachers, I jumped at the opportunity not because I thought it would dramatically help to boost her proficiency in that language, but because I knew it would be a great chance for me to gauge her level, determine her interest and at the same time help to develop her self-esteem and love for the language. 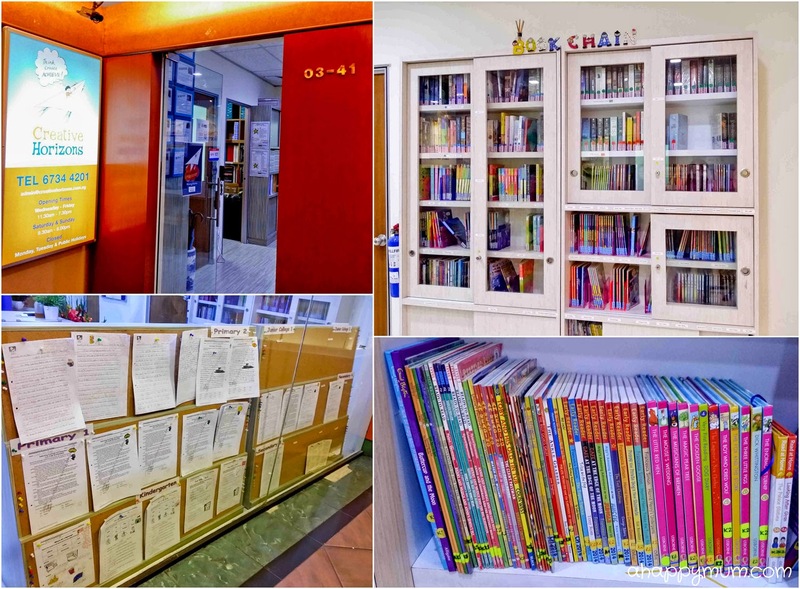 Creative Horizons is an English Language enrichment centre in Singapore and Malaysia that is dedicated to providing students with ways of bettering their English Language skills. They aim to equip students with the necessary techniques and talents to write and speak in a way that commands attention. Under their unique programs, students will learn to 1) THINK - they analyse and explore the different language skills, 2) CREATE - they produce works that are original and creative and 3) ACHIEVE - they attain new skills to realise their potential. 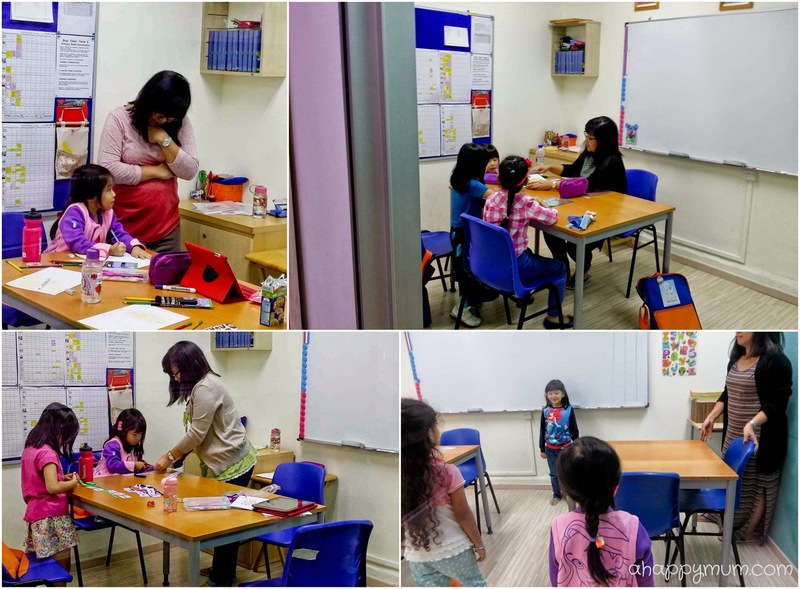 Currently, Creative Horizons has two outlets in Singapore which are located in Orchard and Jurong - our classes were held in the main branch in Tanglin Shopping Centre. The setup of the place is straightforward and welcoming - a well-lit signboard, vibrant blue main wall, an interesting display of written work by the students, a cosy library corner filled with colourful books and well-equipped classrooms with standard furniture and stationery supplies. I personally make it a point to read the essays on the board at every visit because I find it interesting to see what children can come up with. While I still can't picture my girl writing her first composition, I'm definitely looking forward to it. I also love that the students get to borrow and bring home a book to read every week, which is something that delighted my girl and she couldn't wait to share her new story with me each time. Creative Horizons conducts classes for students from Kindergarten all the way to Junior College level. However, before any child can join, there is a rule that he/she must first pass a diagnostic test. I was initially puzzled about the existence and purpose of this test, and was even a tad worried that Angel would not be able to make it through. 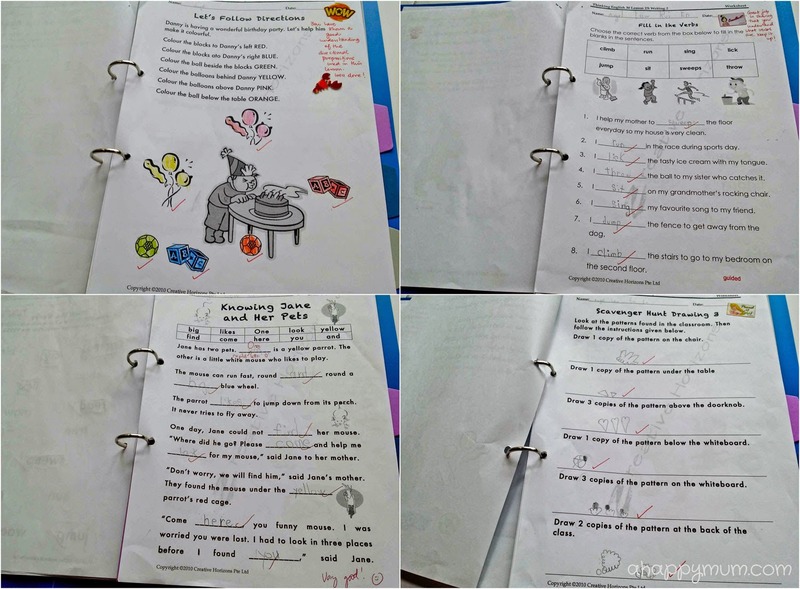 Thankfully, it turned out that the test at K1 level was relatively simple where she needed to name items, write the starting letter of every word and lastly, write all the lowercase letters of the alphabet. When I checked with the staff on the relevance of the test, they explained that a diagnostic test is put in place so that they can roughly determine the child's command of the English language. Since they function as an enrichment centre, it is only in the best interest of the child when he/she can keep up with the pace of lessons alongside the peers and if they deem that a child is not able to benefit the most from their classes, they would advise the parents to send him to a tuition centre or get a home tutor instead. Coming to the lesson content, I have to first tell you that I was only allowed to take pictures from outside the classroom through a glass window, so in a sense, I couldn't sit through any of the lessons and my evaluation could only come from visual observation, brief updates from the teacher and analysis of the work that Angel produced. Her teacher was Ms Nora Kamal, who graduated with a Bachelor Arts degree from National University of Singapore, has an advanced Post-graduate Diploma in Drama and has over a decade of experience teaching English, Literature and Drama in secondary schools. 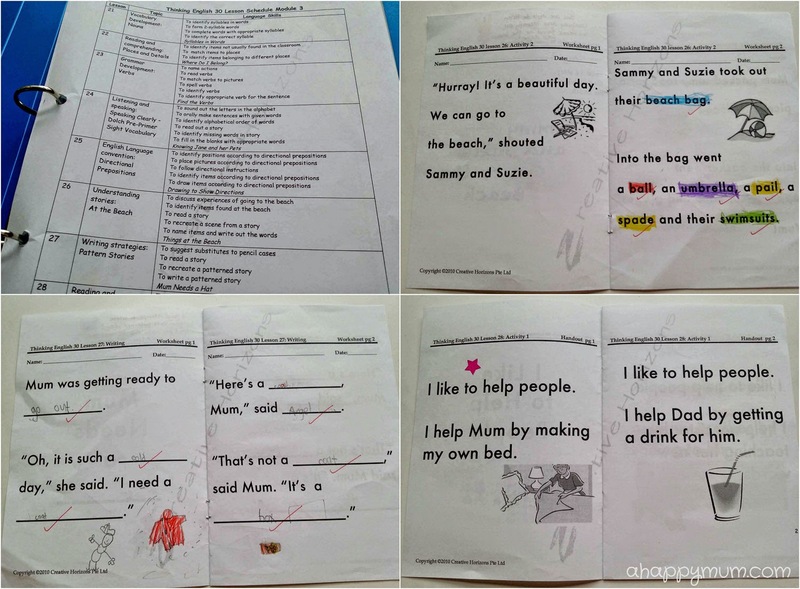 The lessons were well-planned and organised according to the term schedule which indicated the set of language skills to be used in every lesson. I am the kind of parent who likes to know what my child learns at every class so that we can revise and put what she has learnt to good use in practical situations. So, I found the schedule to come in really handy and I do not have to constantly bug the teacher to find out about the weekly topics. Going through her weekly written work was another way to know and recap the skills or vocabulary she had been taught. As I believe that learning works best through play, I was also impressed and relieved to see that Creative Horizons advocates a nurturing and enriching environment where students are encouraged to be interactive, independent and creative. 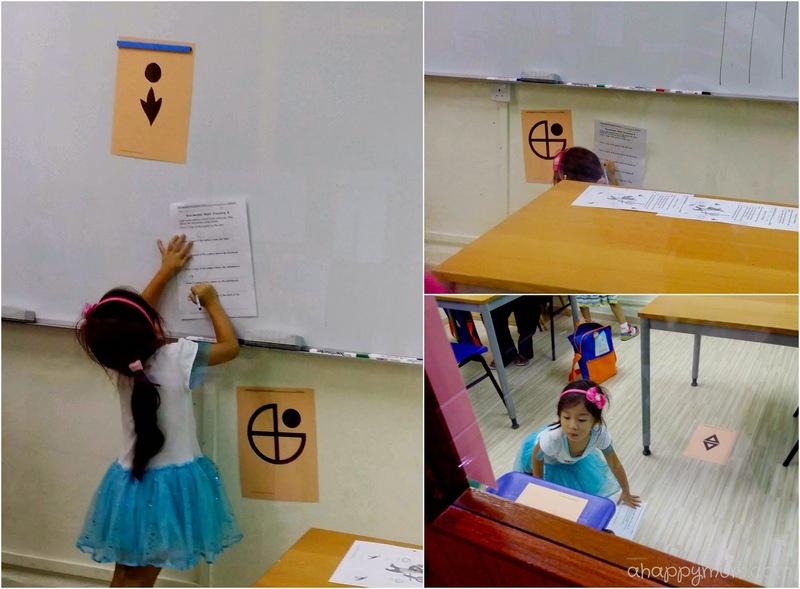 For instance, in one lesson where the students learn about directional prepositions like under, on and above, they did so through a fun scavenger hunt where they had to look for symbols accordingly and attempt to draw them on their paper. In another lesson where they learnt about verbs, Ms Nora taught them through playing Simon Says and asked the students to take turns saying a different verb. I thought that was a pretty smart and innovative way of teaching and it definitely makes learning more enjoyable for the kids. In addition, for the K1 class, students were also tasked to do classwork which involved filling in the blanks, cloze passages, storytelling and reading. 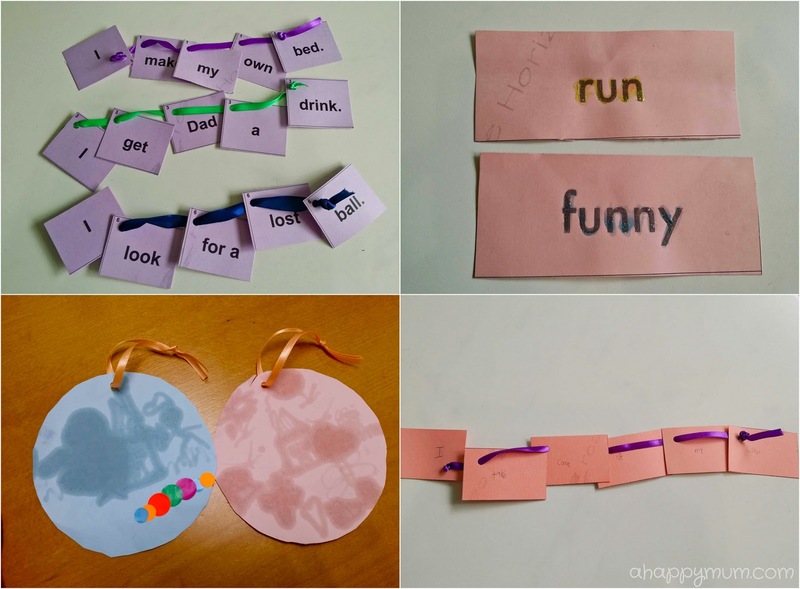 Besides oral and written work, students were also able to do fun activities like stringing words to form sentences, using glitter to write over words and following sequential instructions to make their own suncatchers. When Angel was tasked to come up with her own sentence, I like that it wasn't just herself she was thinking of and she wrote, with the help of the teacher, "I take care of my sister". Talking about the little sister, she was definitely happy to come here as she would be able to browse through books and interact with the friendly staff. For parents, you can either choose to sit and wait outside the centre for your child or hang out at the more happening malls like Forum or Tanglin Mall which are within a short walking distance. During her last lesson, I asked Angel if she loved coming to Creative Horizons and her answer was a definite yes. In fact, she said she would miss her two new friends Lily and Rasleen, as well as the lovely Teacher Nora. Although we have chosen to discontinue for practical reasons - main one being that the lesson falls on Sunday afternoon, which is when we like to bring the kids out to places like the zoo or beach - I can definitely see the good that has come out of this learning experience. Firstly, my girl has fallen deeper in love with the English language which is evident from how she is speaking more of it at home nowadays. Those bits and pieces, well, they are coming into place much better than before. Secondly, while she has always been a happy kid whenever we visit the library, she now chooses the books she likes and says she wants to borrow half of the books in Chinese and the other half in English. Lastly, I dare say that she is also more confident of speaking in English and during our bedtime storytelling, she would try reading word by word out loud on her own. Even though she would take half an hour to finish what would otherwise be a five-minute story, I take that as a positive and encouraging sign. I hope, I honestly hope, I am raising a child who will be effectively bilingual and grow up to have a love for both languages. Thank you, Creative Horizons, for helping us take a step forward! For more information on their programs, timetable, teachers and course syllabus, visit www.creativehorizons.com.sg or their Facebook page. Disclosure: We received a term of complimentary lessons for Angel from Creative Horizons in exchange for writing this review. All opinions are our own.